Secured as a passed-in Lot 364 at the Magic Millions 2017 Perth Yearling Sale. DEMERIT (AUS) (Brown 2006-Stud 2011). 2 wins at 1200m, 1400m, MRC Caulfield Guineas Prelude, Gr.3. Half-brother to SP Evander. 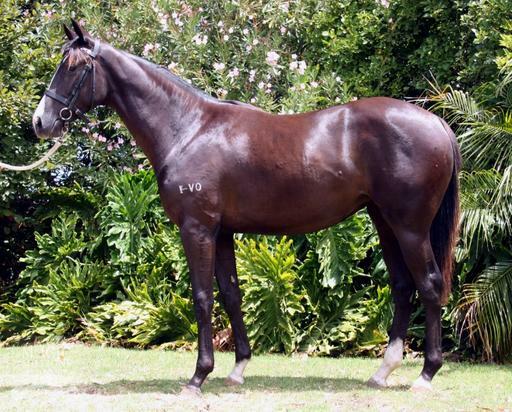 Sire of 104 rnrs, 62 wnrs, inc. SW Agent Pippa (WATC Gimcrack S., Gr.3), Kiss Bang Love, SP Spangled Impact, Ngawi, Arrum Boy, Yeah Dardy and of Special Reward, Yindi, Minus Looks, Puteri Jewel, Danny George, Get the Vibe, Denim Pack, Double Digit, Fille de Merit, If Only, Lorentinio, Anisau, Bergio, Detango, Faulty, etc. Lodestone (f. by Spinning World). 2 wins at 1600m, 1900m in Aust. One Point Lady (f. by Demerit). See below. She's Creative (f. by Excellent Art). Placed at 3 in Aust. Natural Thunder. 3 wins. See above. Midas Millions. 3 wins at 1300m, 1400m in Aust. Royal Mystique. 3 wins from 1750m to 2050m, 3d VRC Light Fingers H., 4th VRC Maribyrnong Trial S., L. Producer. Respectful - Pileski's Star (Mal.). 3 wins at 1200m in Malaysia. GOLDEN UNICORN (Jevington). 6 wins. See above. Super Unicorn (Ksar). 3 wins-2 at 2-at 1000m, 1200m, MVRC Youthful H., WATC Minchinbury Champagne H., 3d VATC Thoroughbred Club S., Gr.3, WATC Qantas Initial P., 4th WATC NJ Way Quality S., L. Producer. Sipowicz (Success Express). 6 wins-1 at 2-to 1250m, A$196,542, MRC Moss Rocket H., Rancher H., 2d SAJC RN Irwin S., Gr.3, MVRC FSM Business Travel H., SAJC Allan Scott Park Morphettville H., VRC Sandown Hillside Sprint H., MRC Betfair H.-twice, Mookta H., 3d MRC The Age H., SAJC Allan Scott Park Morphettville Flying H.-twice, Come to Allan Scott Park Flying H., MRC Le Pine Funerals H.-twice, FE Elbeshausen 2YO H.
Imprimis (Magnus). 2 wins at 1000m, A$111,025, 2d VRC Herald Sun Superracing S., L, MRC Sportingbet 2YO H., 3d VRC Streets Ice Cream S., L.
PINKER PINKER (Reset). 6 wins-1 at 2-from 1100m to 2050m, A$2,609,368, MVRC WS Cox P., Gr.1, VRC Let's Elope S., Gr.2, MRC Angus Armanasco S., Gr.2, VRC Matron S., Gr.3, Voodoo P., MRC Blixen 2YO H., 2d ATC Epsom H., Gr.1, MRC Futurity S., Gr.1, MVRC WH Stocks S., Gr.2, 3d Australian Oaks, Gr.1, MRC Kevin Hayes S., L, 4th ATC Vinery Stud S., Gr.1. Kapset (Reset). 5 wins at 1200m, 1600m, A$175,497, to 2016-17, MRC Thomas North H., Eastcoast Plumbing Group Traralgon H., 3d VRC Poseidon S., L, MRC Champagne Pommery H., Selangor Turf Club H., Le Pine Funerals H., SAJC Irish Race Day H.
DON REMON (Lorenzaccio). 5 wins-3 at 2-to 1400m, A$87,760, WATC Sires' Produce S., Gr.2, Prediction H., Jovial Lad H., Tusitala Quality S., Laroette H., 2d WATC Fairetha S., L, Melvista S., L, 3d WATC Canberra Television Classic H., L, 4th WATC Ngawyni S., L. Sire. WINE 'N MUSIC (Desert Wine). 2 wins at 2, US$211,145, Del Mar CTBA S., L, 3d Santa Anita La Habra S., L.
CHIME AFTER CHIME (Cari Jill Hajji). 8 wins from 6f to 9f, US$247,038, Golden Gate Work the Crowd S., L, 3d Hollywood Park Royal Heroine S., L. Producer. LINDZ WINZ (Vronsky). 9 wins to 7f, US$351,670, Santa Anita Irish O'Brien S., L.
Race Record: 5 Starts 0-0-4 A$10,920. Placed at 2 & 3 to 2018-19, 3d WATC Penang Turf Club 2YO Trophy, Glenroy Chaff 2YO P., Tabtouch P.